For infant nutrition, we developed a full range of highly nutritious dairy ingredients answering the specific needs of infant formula and baby food. Gastrointestinal comfort, cognitive development and formula optimisation are some of our main concerns. Low temperature process preserving biological value and amino acid profile. Used in infant formula, Prolacta® contributes to the healthy growth and development of infants. 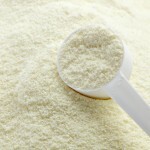 Calciane is a milk mineral concentrate directly extracted from cheese whey through physical process.